This article is about the food dish. For the mountain peak, see Păpuşa. Pupusa is thick cornmeal flatbread from the Pipil culture of El Salvador. It is stuffed with one or more of the following ingredients: cheese (usually a viscous cheese called quesillo that is very common in certain countries), chicharrón (pork rinds), squash, refried beans, or cheese with loroco. It can also be made with a mix of ingredients such as cheese, beans, and chicharrón. It is typically accompanied by curtido (a spicy cabbage slaw), and tomato salsa, and is traditionally eaten by hand, without the use of utensils. The preparation process of this dish consists of many diverse steps, and the use of a variety of ingredients, those of which also constitute economic support for the productors. Pupusas also display a similitude to Venezuelan arepas. The pupusa is the most common staple food of El Salvador, most likely because it is a traditional dish that has been passed down from generation to generation. Although the specific origin of pupusas is unknown, anthropological studies show that was started in Central American territories, most especially in the western part of El Salvador. Although there are existing controversies that have taken on an international character about the origin and right of the traditional dish, these controversies have not triggered any significant consequences. Pupusa may be a Spanish rendering of popotlax, which is a combination of the Pipil or Nahuatl words popotl, meaning "large, stuffed, bulky", and tlaxkalli, which means "tortilla". It may also come from the Pipil language. 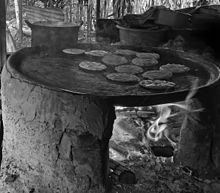 Traditional pupusas in El Salvador are cooked over wood fire, using a pottery griddle (called a comal). Pupusas were first created centuries ago by the Pipil tribes who inhabited the territory now known as El Salvador. Cooking implements for their preparation have been excavated in Joya de Cerén, "El Salvador's Pompeii", site of a native village that was buried by ashes from a volcano eruption, and where foodstuffs were preserved as they were being cooked almost 2000 years ago. The instruments for their preparation have also been found in other archaeological sites in El Salvador. The pre-Columbian pupusa were vegetarian and half-moon shaped. They were filled with squash flowers and buds, herbs such as chipilin and mora, fungi and salt. By 1570 meat had been incorporated into the filling, as noted by Franciscan friar Bernardino De Sahagun. In the late 1940s, pupusas were still not widespread across El Salvador, and were mostly localized in the central towns, such as Quezaltepeque, and cities of the country. As the population began migrating to other areas in the 1960s, pupusa stands proliferated across the country and in neighboring areas of Honduras and Guatemala, sometimes with variations in shape, size or filling. In Guatemala during the 1970s, pupusas had a half-moon shape. The half-moon shape would be considered a half-eaten pupusa in the Chalatenango area; fish pupusas were uncommon, and pupusas served east of the Lempa River usually had a much larger diameter. In the 1980s, the Salvadoran civil war forced a Salvadoran migration to other countries, mainly the United States. Therefore, pupusas became available outside the country wherever a Salvadoran community was found. Immigrants have brought the dish to most areas of the United States. Pupuserías also may be found in many areas of Canada. In recent years, pupusas can even be found in some Latin American restaurants in Adelaide, Melbourne and Sydney in Australia. On 1 April 2005, the Salvadoran Legislative Assembly declared pupusas as the national dish of El Salvador and every second Sunday of November would be National Pupusas Day. A fair is typically held on the day in the capital and a few big cities. On 10 November 2007, in celebration of National Pupusa Day, the Secretary of Culture organized a fair in the capital park in which they would make the world's biggest pupusa. The pupusa was 3.15 meters in diameter and was made with 200 lb. of masa, 40 lb. of cheese, and 40 lb. of chicharrón. It fed 5,000 people. Five years later, the record was broken again with a pupusa 4.25 meters in diameter. Guinness World Records lists the largest pupusa at 4.5 metres, created in Olocuilta, El Salvador on November 8, 2015.Currently, there are several "pupusa" festivals as a celebration from Salvadorans to their cultural traditions; the first festival of la Pupusa took Place in Toronto, Canada in 1997 and since had widespread in many cities across North America. In 2011, The Guardian named pupusas that year’s Best Street Food in New York. Both at home and abroad, pupusas are traditionally served with curtido (a pickled cabbage relish, analogous to German Sauerkraut and Korean kimchi that comes in mild and spicy varieties) and tomato sauce, and are traditionally eaten by hand. Recommended for individuals without experience: Take a spoonful of masa and flatten it on a flat surface so that it forms a circular shape and is about 5 mm thick. Next you place a spoonful of the filling in the center and spread it out, taking care not to fill the edges. Next you place another spoonful of masa on top and carefully seal the pupusa around the border. Recommended for those with experience: form a ball of two spoonfuls of masa. With your fingers, make a hole in the middle of the ball, and to fill it with the filling mixture. Close the hole and pat the ball between both hands as if you were clapping, taking care to give the pupusas circular form. In both methods, one should take special care that the pupusa is a circular shape, that the filling is well distributed, that the layer of masa isn't too thick, and that there aren't any holes through which the filling could spill out. El Salvador and Honduras both claim to be the birthplace of the pupusa. Salvadoran archeologist Roberto Ordóñez attributed the creation of the pupusa to the Pipil people due to the name meaning 'swollen' in the Pipil language, and the artifacts found in the Joya de Ceren which show ingredients and tools that were used to make an early version of pupusas. Honduran etymologists say that since the Pipil language is so close to the Nahuatl language, the Honduran Nahua tribe could have created the dish. The topic of the pupusa’s origin also came up during the negotiation for the CAFTA-DR. Both nations wanted to make the pupusa an exclusive export. After two days the Honduran delegation ceded the right to El Salvador. A variant of the pupusa in El Salvador is the pupusa de arroz. Rice flour is used to make the dough and they are usually stuffed with chopped pork, cheese, beans, zucchini, and other vegetables. They hail from the town of Olocuilta, located to the east of San Salvador, but are now readily available throughout the country. Another regional variation, found in Alegría, is the pupusa de banano, which calls for the addition of plantain bananas to the pupusa. Pupusas are also found in neighboring Central American countries. Honduran versions use the local quesillo type of cheese for the filling. In Costa Rica, both "Salvadoran pupusas" and "pupusas" are available, the latter being a local version. There, they are a staple of the food stalls at regional carnivals known as fiestas. A similar Mexican dish is called a gordita (literally, "little fatty"), but gorditas are usually open at one end. 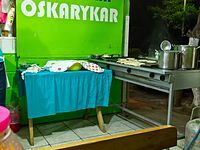 In Venezuela, they make arepas (where the dough is cooked first, and then sliced in half and stuffed somewhat like a hamburger). Colombia has its own recipe of arepas, but, unlike Venezuelan, Colombian arepas are usually eaten without filling, or the filling is placed inside the dough before cooking. Pupusas made in the United States are typically made with Maseca (brand) commercial corn flour-masa mix, instead of fresh masa harina. 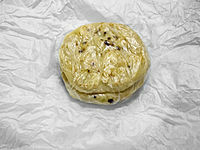 Some high-end pupuserías in the United States use rice flour and wheat flour versions. In Santa Fe, New Mexico, variations include using spinach, pepperoni, cheese, and green chile. Taco Cabana, a Tex-Mex chain in Texas, created a dish called the pupusa that has no relation to the Salvadoran food. In spite of their low market price, pupusas represent an important element in the economy of El Salvador. In addition to whole pupusas, the individual ingredients are also exported; in 2005 for example, US$604,408 worth of loroco, sometimes used as a pupusa filling, was sold to the United States alone. Frozen pupusas can be found in the refrigerated section of many Hispanic and international supermarkets in the United States, especially ones that are located in highly concentrated areas of Salvadorans such as Washington, D.C. and Long Island, New York. Pupusa sales play a significant role in the Salvadoran economy. 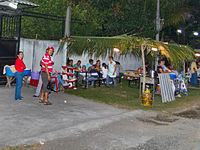 According to the Salvadoran Ministry of Economy between the years of 2001–2003, pupuserias generated 22 million dollars. The export of ingredients such as loroco has also helped boost the economy. As of 2005, 300,000 people made pupusas for a living, with a majority of them being women. 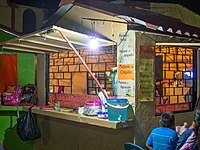 ^ a b "Historia de la Pupusa Salvadorena". redislam.net. January 2013. ^ "Decreto Día Nacional de las Pupusas — Asamblea Legislativa". www.asamblea.gob.sv (in Spanish). Retrieved 24 September 2017. ^ "Largest pupusa". Guinness World Records. Retrieved 24 September 2017. ^ Resnick, Perry (26 September 2011). "The best street food in New York". The Guardian. ^ Gómez, Iván (8 December 2003). "Honduras Insists pupusas". ^ "Las Pupusas: ícono culinario salvadoreño celebrará su día". El Periodista. 4 November 2014. 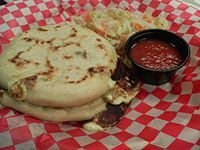 Wikimedia Commons has media related to Pupusa. Carman, Tim. "Perfect Pupusas Require a Mastery of Masa." Washington Post, The, 2012. Lawson, Susan C. "Latin LESSONS." Indianapolis Monthly, vol. 25, no. 10, 2002, pp. 164. Nickles, Greg. "The Flavors of El Salvador." El Salvador: The People & Culture, 2002, pp. 28-29. Planet, L.; Staff, Lonely Planet Publications (2012). The World's Best Street Food: Where to Find It and How to Make It. Lonely Planet Publications. p. 137. ISBN 978-1-74321-664-4. Retrieved 30 July 2016. Scherer, Jane. "Pupusas." Faces, vol. 15, no. 3, November, 1998a, pp. 19.